West Cornwall's artistic tradition dates back to the early nineteenth century - to a visit by JMW Turner in 1811. Since then, the rugged beauty of the landscape and the clarity of the light have continued to attract artists from all over England, Europe and the USA. For pictorial artists, the clarity and quality of the natural light has always been a major influence, while for other creative artists, it has been the relaxed, inspiring and encouraging nature of the environment. In all art forms, the way of life of the local inhabitants and their environment has been an inspiration. In the late 19th Century, Newlyn became home to an artistic colony attracted both by the light and the potential subjects and, by 1884, a group of painters collectively known today as the Newlyn School brought this small fishing village to international attention. This group drew their inspiration from the French style of "Plein Air" painting, portraying their subjects in their natural surroundings with many painted outdoors 'on location'. 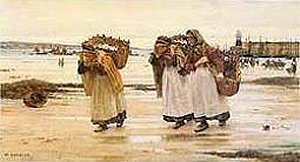 First amongst this group was Walter Langley, who began working in Newlyn in about 1882. 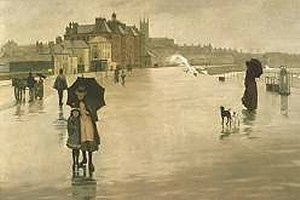 Working mainly in water-colour, his paintings are recognised amongst the most important of the Newlyn School. One of the foremost of this group was Alexander Stanhope Forbes, who brought the Newlyn School to major public notice with a painting named "Fish Sale on a Cornish Beach", which was shown at the Royal Academy in London in 1885. The group grew in number until 15 nationally recognised artists were working in Newlyn. Amongst these was Elizabeth Armstrong who ultimately became Stanhope Forbes' wife. The Penlee House Gallery and Museum in Penlee Park is home to much of the best of this work and holds the largest collection of Newlyn school paintings in the country.